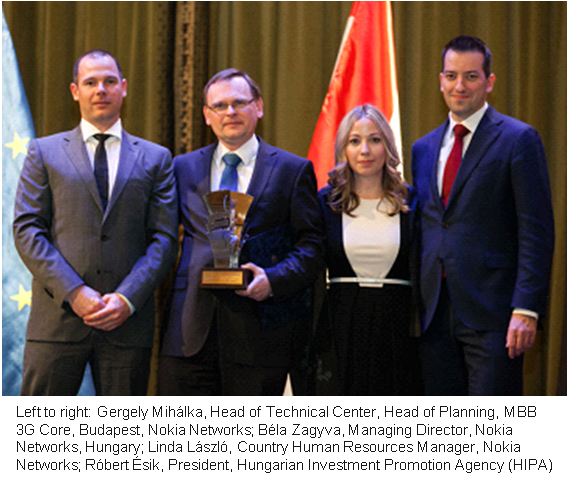 The Ministry of Foreign Affairs and Trade, together with the Hungarian Investment Promotion Agency (HIPA), has awarded Nokia Networks Hungary as Company of the Year for R&D Investment in 2014. The event took place on March 19, 2015, in Budapest with the aim to recognize investors and companies in eight categories. The Minister of Foreign Affairs and Trade in Hungary, H.E. 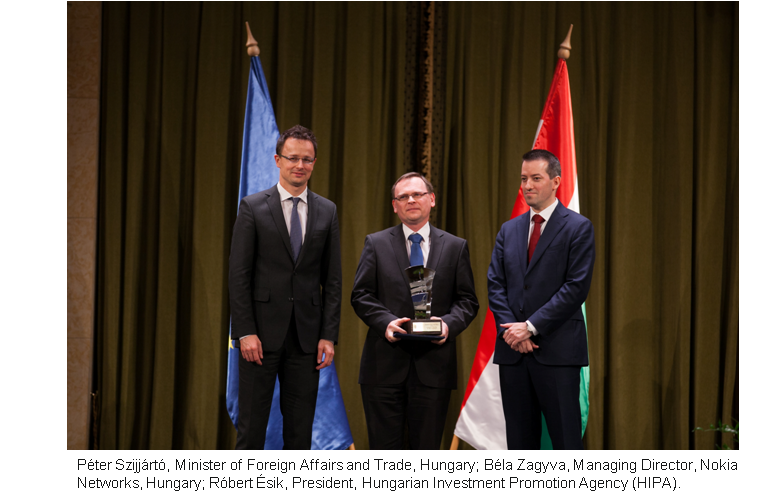 Mr. Peter Szijjarto, presented the award to Nokia Networks Hungary for demonstrating outstanding activities and commitment to the contribution of the country’s economic development. “Nokia’s R&D center in Hungary is a good example of how local innovation is transformed into real business advantage globally, and how local efforts can result in a global market success,” says Minister Szijjarto. Established in 1998, Nokia Networks’ R&D facility in Budapest is one of the company’s premier research and development centers. Nokia Networks places innovation at the heart of its strategy to help operators deal with the continuing data deluge in wireless networks, with a vision to enable mobile broadband networks to deliver gigabytes of personalized data per user per day by 2020. Last year, the Budapest R&D center strengthened its operations in Hungary with the development of its proven capabilities in advanced telco cloud software solutions. As one of the leading proponents of this technology since its inception, Nokia Networks brought the telco cloud offering to commercial readiness already last year. Cloud-based infrastructure will provide major benefits when it comes to flexibility in the product development cycle: Rather than develop a product and slowly integrate it into a legacy infrastructure with lengthy testing, operators will enjoy a much shorter innovation cycle and the freedom to rapidly adopt new ideas. In addition to telco cloud, the center plays a critical role in developing future-ready technologies like Security, Circuit Switched Core, IMS (Multimedia Subsystem), and Voice over LTE based on Open Telecommunication Application Server (Open TAS). VoLTE, for example, is already proving to be a transformational technology in the advanced markets we supply, such as Korea. It provides true high-definition audio that delivers the full spectrum of sound to the user for crystal-clear communications, greatly improving the customer experience. Hungary has a very competent pool of engineers, with the right mindset to excel in the telecommunications industry. These are key factors for Nokia Networks to provide our customers with real quality and innovation. We have created a solid platform for talented individuals to showcase their skills to the world. Nokia Networks is also one of the main supporters of higher education for engineers in Hungary through its Cooperative Educational Program. The collaboration with universities has strengthened over time and transformed into comprehensive partnership. Please share your thoughts on this topic by replying below - and join the Twitter discussion with @NokiaNetworks using #NetworksPerform #mobilebroadband #innovation #Nokia.